I’m not going to lie, starting an organic garden can get expensive quick! From gardening tools, to organic seeds, to organic potting soil, and everything in between, an organic garden can stretch your buck in the beginning. But then your garden starts to pay you back season after season, year after year. 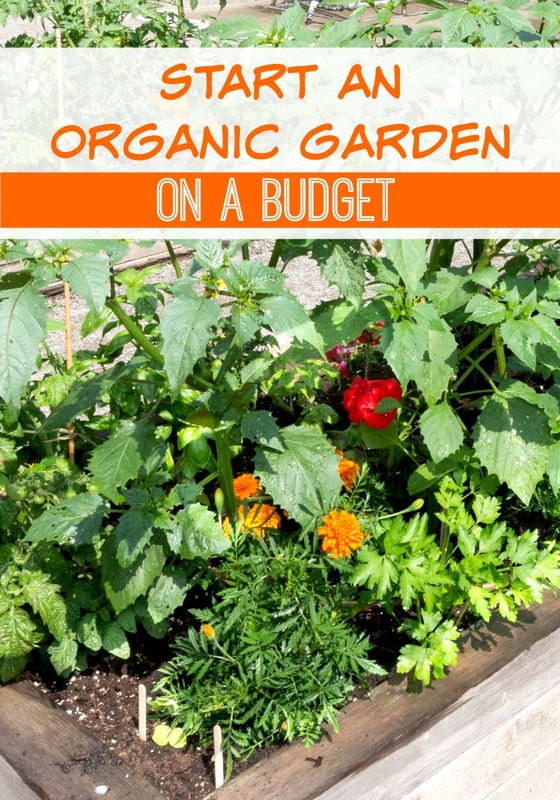 I have come up with a few tips on starting an organic garden on a budget. Are you ready to start an organic garden this year? I am! Disclosure: This post not only talks about my organic gardening, but also has Affiliate Links that I earn commissions from. This is how I make a living and keep this little blog running. Thank you for supporting me! I appreciate it. Much love, Kristi. First off, do you have space for a backyard garden or do you have a small balcony or tiny patio? Those of you blessed with backyards can grow directly in the ground or build inexpensive raised beds. Build the beds out of cinder blocks or untreated wood or even unused pallets. For those with small spaces, think along the lines of container gardening or better yet, vertical gardening. I’ve picked up many great containers at yard sales, dollar stores, and on clearance at Home Depot and Lowe’s. Now some of you might be like me this year and don’t have any of the above, but you still want to garden. Seriously, I have a small balcony at my condo and have rented a space in my local community garden. Have you ever heard of community gardening? In quite a few urban neighborhoods there are gardens where you can rent a little piece of land for the season. Mine cost just $25 for the season! They also have these at churches and other organizations. I only grow Organic, Non-GMO seeds, mostly Heirloom at that. Organic seed packets are $2-5 each and have anywhere from 20-200 seeds in each packet. I can not possibly grow that many plants! That is just too many! I first learned of seed exchange parties when I was a member of a few gardening clubs in Phoenix. Now I love to host them too. Everyone brings their seeds packets over, you have those tiny manilla envelopes and you share your seeds with others. You then get so many more different varieties than you would have on your own for FREE! Just a little post I wrote to help you out to learn the difference between heirloom open-pollinated, hybrid, and GMO seeds. Many different gardening clubs, including your county’s Cooperative Extension office has plant sales. You will find plants here to be much less expensive AND without pesky bugs that you might find in big box stores! You might also find a fellow gardener that is dividing their plants will give you one or two to help grow your little garden. Farmer’s Markets are also a great place to look for organic growers that sell their plants. I did this for five years and loved it! If you are buying plants at a nursery, always try to buy a flat or a 6-pack as they are less expensive than buying single plants. If you have a large area, or a few raised beds you are filling, consider buying good quality dirt by the truckload. If it is just one bed, containers, or a smaller area, you can get by with bags of organic potting soil. Let me pause here and say this – the potting soil you buy is VERY important. When I first started out I bought the cheapest stuff Home Depot had. Nothing grew, it was a waste of time and money. I’m not a fan of Miracle Gro or Scott products becuase of the sheer amount of chemicals that they put out into the world. I tried a lot of different soils and my faves are Black Gold and FoxFarm Happy Frog. I really don’t use anything else unless I make compost myself. I also only use organic fertilizers like blood meal, bone meal, bat guano, fish emulsion, and earthworm castings. If the numbers on the fertilizer are 5-5-5 or 10-10-10 you know it is synthetic – things in nature don’t grow like that. Gardening tools are not cheap in the least. If you have Harbor Freight in your area go there. I also can find some good tools on Craigslist, at yard sales, and just by asking friends if I can borrow theirs for the day. Clean your tools with a good strong vinegar water solution so that you are not bringing bacteria or pathogens into your organic garden. Following these tips will reduce the cost of initially starting your organic garden. Just wait until you no longer have to pay $4 for a bag of organic spinach or $3 for a bunch of kale at the grocery store! Initial gardening expenses can add up, but in the long run, they are cheaper than what you are purchasing at the store. Plus, they taste better and you have gotten your exercise in at the garden! Did you know I founded an organic gardening subscription box, Seed Plant Bloom? Every month receive Organic, Non-GMO, or Heirloom seeds. Plus soil amendments like bat guano and earthworm castings, garden gifts and accessories, and plants or succulents when it is too cold to garden outside. Check it out! I did another post on Ready to Start a Garden that has a lot more things listed out and you might want to give it a quick read. For making designs on gardening tools play a great role.I bought a zero turn mower for my garden which helps me in making cutting grass so that my garden will look beautiful.